The expert of repartee and wordplay, Tom, over at Perfume Smellin' Things has published a little write up about our perfumes. Head on over, red rover. While your there, you may want to read some of his other postings, he is the manifestation of wit on earth. 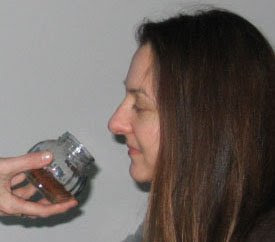 The photo is me at "The Fragrant Alchemist Workshop" smelling some Raz de Hanout and Vanilla tincture created in class by Eva Marie Lind. More on that one day soon...promise...but, first more on NYC Sniffa, Rosa and the new solid perfumes. Your parfums become more and more famous, Roxana. Congratulaions. When did you make your first perfume? How long are you busy? Yes, indeed, the word continues to spread...like one of our wild fires. I made my first "official" botanical perfume at a class in Malibu I helped organize with John Steele. I write a blog post about it to give the details and notes. How long am I busy? Can you rephrase the question?